Came to Great Yarmouth for the day last Saturday after a long absence. Popped in this 'Spoons and was amazed by the size. Is it the biggest one in Britain? Unfortunately I was driving that day so had to content myself with coffee, but was very impressed by the place. Will be back in summer and not driving next time! Nothing wrong with this pub at all. 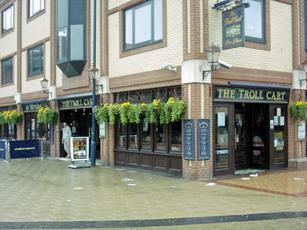 If I'm in Yarmouth for the day I usually pop into the Troll Cart for a couple of swift halves. enjoyed a few pints in here last week,adnams ghost ship,nethergate growler and mauldons silver adder at £2.15 all very good.always busy on my visits,but service was good.still selling mini cheddars which my local spoons in Sutton have stopped.handy with cab rank and bus station outside. Nothing much to add really. Do the couple with the lady in the wheelchair still go there? She seems perfectly capable of walking, and gets up and goes outside for a smoke whenever he's at the bar or in the WCs. They seem to entertain themselves by mouthing off at anyone they've not seen before. Went here on Jubilee Sunday with my wife and elderly in-laws. Being a bank holiday it was packed with National anthem singing revellers, but we had no trouble finding a seat. There was a good selection of ales, I had the Woodforde Nelson, which was fine. Our food was adequate - the joy being that you know what to expect in a Weatherspoons pub. Mum in-law enjoyed her salmon, Dad in-law was amazed that he got 11 pieces of scampi, my Chicken Masalla was the same as it ever is. Service was prompt, considering that the pub was busy. I would never knock a 'Spoons pub. They've good it down to a fine art.